Our primary goal is to teac​​​​h you how to trade at the speed of YOU! To efficiently trade any market, you must first develop a sound foundation for how to analyze any market. 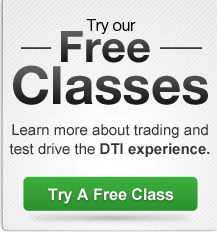 We can teach you how to apply our DTI Method to analyze a variety of diversified markets including stocks, options, futures, ETFs, bonds, commodities, currencies and more. We are here every step of the way to provide a solid foundation of our proprietary techniques. With your trading goals in mind, our objective is to transfer years of trading experience from our DTI educated instructors to enable you to Trade at the Speed of You. From analyzing the German DAX futures market to actually entering and managing a stock trade during earnings season, our programs and tools are designed to slow the market down to a pace that fits your trading style. Whether you pursue our Core Education programs, our Special Focus Classes or our Destination Workshops, each class has a precise purpose and is finely tuned with no fluff. Our goal is to get you to your destination by building your trading knowledge and skillset with LIVE on-site and online market education. In the digital world that we now live in, it would be easy to only offer trading education online. However, we firmly believe in the benefits of learning with face-to-face interaction. Our national training center located in Mobile, Alabama gives our students a place they can come learn to trade in-person from our instructors in an amphitheater-style classroom. We offer BOTH live on-site and online classes held multiple times throughout the year so you can learn when, where and at the pace that suits you best. You’ll receive unmatched quality and consistency in your instruction learning our trading method from DTI’s founder and 40-year veteran trader, Tom Busby, as well as the DTI’s Chief Instructor Geof Smith. Since the company’s founding in 1996, Tom and Geof have taught thousands of DTI students to successfully utilize our method. At DTI, it’s all about you! Our goal is to teach you to trade at the speed of you based upon your personal goals, your resources, and your available time. Are you a beginner looking to learn to invest in stocks or options? Are you a more seasoned trader still experiencing costly mistakes? We are here to help, but first we need a favor from you! Your DTI experience starts by filling out your unique RoadMap™ Profile. Then one of our advisers can put together your customized educational plan comprised of our Core Education, Special Focus Classes and/or Destination Workshops. We want you to be successful and are as committed to you as you are to us. Whether you have zero experience or have traded for many years, DTI can put together a trading education game plan that is suited to your particular needs. ​"We won't give up on you unless YOU give up on you!"